Back by popular demand, Stroma’s sonic feast that spans the centuries. Bridging three millennia of music, Stroma’s own string quartet teams up again with early music specialists Kamala Bain (recorder) and Rowena Simpson (soprano) — in the beautiful surroundings of the Sacred Heart Basilica. 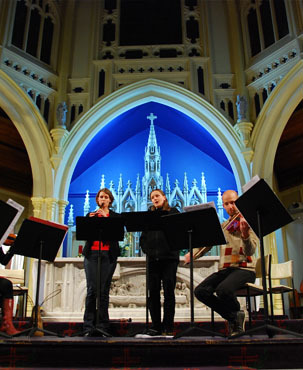 Works by New Zealand composers are interleaved with arrangements of Medieval and Renaissance music from composers who truly ‘pushed the boundaries’ of music, often foreshadowing twentieth-century developments. One work is even based on the earliest known notated melody dating from 1400BC. We are also pleased to give the world premiere of a new work by Wellington composer Chris Watson.